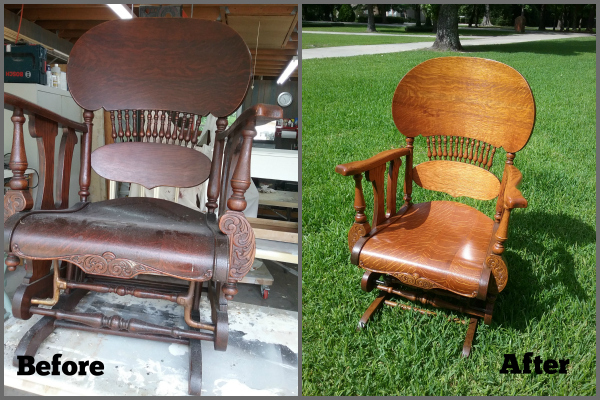 With a baby due only a month away the pressure was on to restore this beautiful Victorian glider rocker. It was a new challenge for us since we've never restored a glider before, especially one with a broken mechanism. It was made out of tiger oak and we could see the beauty of the wood glinting beneath the old, flaky varnish. Definitely time for the Heirloom Restored treatment! We discovered that the mechanism was called a Lowentraut mechanism, which is a cast iron arm at each end of a wood spindle. The chair originally would have had a double set of these mechanisms and despite searching high and low on the Internet we could not find a company that still made these. Time to put on our thinking caps! Dewey mulled over it for a while and then came up with an innovative solution involving a metal plate which he milled himself. Fortunately the Lowentraut mechanism at the front was still complete and in working order. To refinish the wood he stripped the tiger oak back to bare wood and then refinished using conversion varnish (the owner wanted a hardwearing, baby-proof finish). To repair the glider mechanism he milled two metal plates and after spraying with a dark metal finish (the original mechanisms were also stripped and sprayed to match), we put these in place with the central bar pushing against the plates. Finally the chair was put back together and it was great to see how well it worked! Our client was stunned to see how great the chair looked and is looking forward to spending her 'rocking' time with the new baby in a few weeks. It was a family heirloom and it is great to see something like this being reloved, with a new lease of life, and pride of place in a home!